Neither my mother nor my father could swim much, but next to my father, my mother was an Olympic champion. Mom’s craned-neck-and-head-above-the-water side-winding dog paddle kept her weekly-styled hair from getting wet while she cruised around the pool sporting her jaunty rubber bathing cap adorned with rubber flowers. But Dad couldn’t swim a stroke and he developed a slapping splashing dog paddle to nowhere with his toes firmly attached to the bottom of the shallow end. Nowadays, brightly colored inflatable green crocodiles, purple octopuses, neon pool noodles and polka-dotted arm floaties are created to keep us non-swimmers afloat while we frolic in the water. But back then, the simple, no-nonsense inner tube was serious business and Dad was an inner tube Jedi. The tube needed to be wet down and cooled off in the swimming pool before it could be climbed into, because it was heavy and black, got hotter than blazes sitting in the sun and reeked of burning rubber. Dad would push the steaming stinking inner tube into the water, hold his breath and tiptoe wincing and shivering down the slippery steps to get himself loaded in and stabilized. Then, not having moved more than about a foot from the edge, he would he row himself over in one short stroke to haul me in for a thrilling ride around the pool. 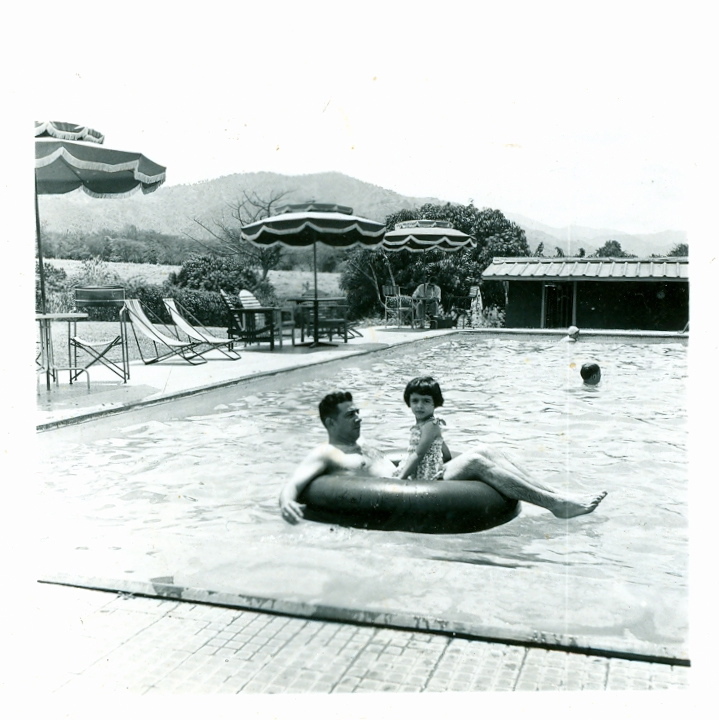 In Guatemala, I badgered my parents into sending me for swimming lessons at a local pool. I distinctly remember hating every second of the experience because the pool and the water were green and slimy and loaded with lots and lots of splashing, spitting people. I survived two or three lessons and have since fended for myself. I can tread water endlessly in a buoyant waveless sea and I can swim back and forth with my face in the water provided I’m wearing a mask and snorkel.